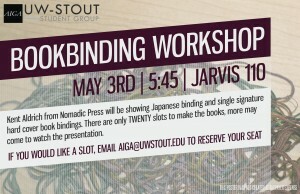 Kent Aldrich from Nomadic Press will be showing Japanese binding and single signature hard cover bookbindings. There are only TWENTY slots to make the books. 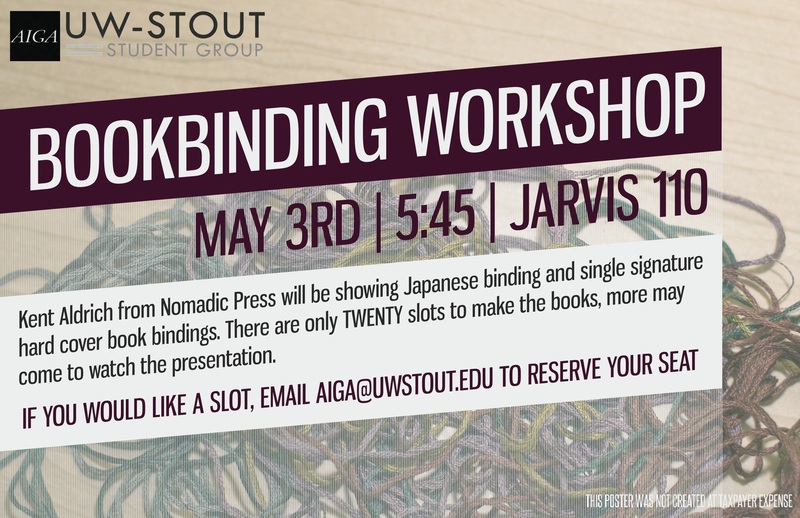 Email AIGA@Uwstout.edu to reserve your seat. 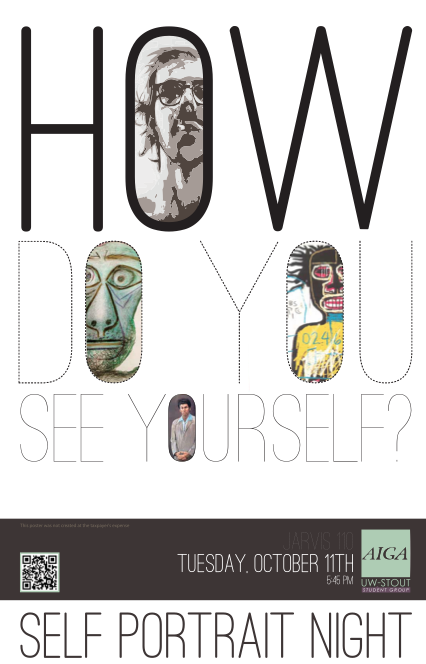 Come and show us what you have been working over the past semester. Whatever it is, large or small, we want to see it. You also get the opportunity to see what others have been working on in their classes. 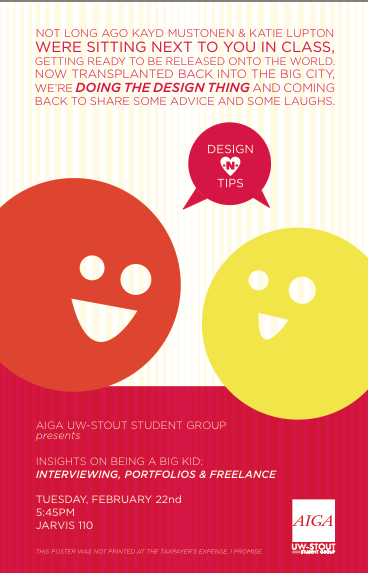 Come and hear what everyone learned at portfolio 1 on 1!! An overview of setting up a personal website built through WordPress. The design world today requires that you know at least some parts of digital/web/interactive design to survive. 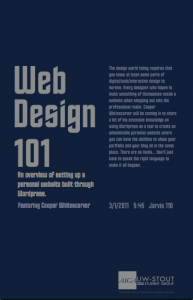 Every designer who hopes to make something of themselves needs a website when stepping out into the professional realm. 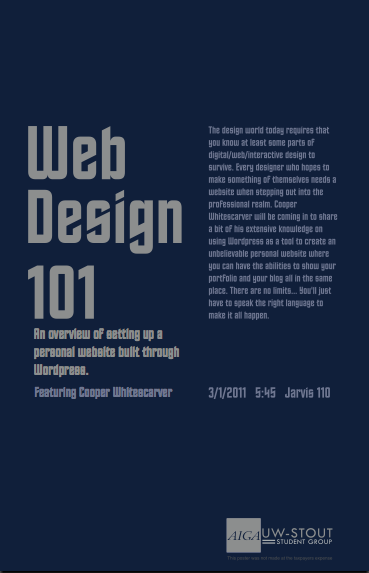 Cooper Whitescarver will be coming in to share a bit of his extensive knowledge on using WordPress as a tool to create an unbelievable personal website where you can have the abilities to show your portfolio and your blog all in the same place. There are no limits… You’ll just have to speak the right language to make it all happen. Attention Design Students (Industrial, Graphic, Interior and Multimedia) as well as all Packaging Engineering Students and Graphic Communications Management Majors. 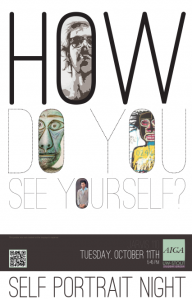 Would you like to know what a day in the real-world life of cross-disciplinary design is like? 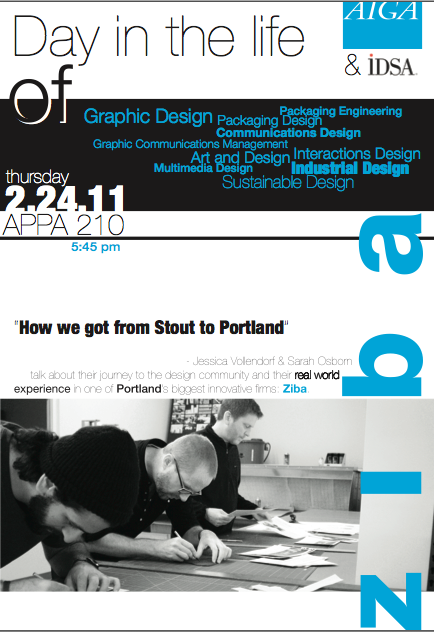 UW-Stout’s AIGA Student Group along with IDSA’s Stout Chapter is hosting two Senior Communications Designers from Ziba Design, Inc. out of Portland, OR: Jessica Vollendorf & Sarah Osborn. They will talk about prototyping and it’s role in the print, packaging, product, interaction, and environment design process. They will also explain the value of a brainstorming culture for coming up with innovative solutions. Both Sarah and Jessica have worked on packaging and branding as part of holistic design solutions. Some companies they have worked with are P&G, Nike, Aerie, Patagonia, Crate&Barrel, & Wolfgang Puck as well as other Fortune 100 companies. Both designers hold a Bachelor of Fine Arts degree in Art and Graphic Design from University of Wisconsin-Stout. Sarah is a senior communications designer at Ziba, an innovation and design firm based in Portland, Oregon. Sarah’s focus at Ziba is creating packaging and branded solutions that tell holistic stories. She works with Fortune 100 companies to create cohesive touch-points across brand and product experiences. Sarah has worked on packaging structure, graphic design, environmental design and copywriting for companies especially in the health and beauty industry, including P&G and other cosmetics companies. Prior to Ziba, Sarah worked for Outset, a designer and producer of high-end grilling and barware accessories. As both designer and copywriter, she designed packaging structures and graphics for 250+ products, websites, identities, print collateral, supported product design, and wrote copy and brand messaging. Her other clients included Kingsford, Crate&Barrel and celebrity chefs such as Tyler Florence and Wolfgang Puck. Sarah earned her Bachelor of Fine Arts degree in Art and Graphic Design, and minor degree in Journalism from University of Wisconsin-Stout. Sarah enjoys oil-painting, playing tennis and screen-printing. Her favorite activity is shooting film photography during the beautiful Portland summers and while traveling. 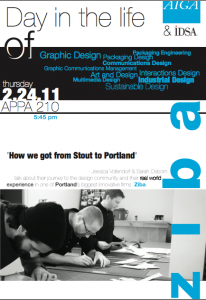 Jessica is a senior communications designer at Ziba, an innovation and design firm based in Portland, Oregon. Jessica specializes in packaging design and has a strong understanding of the relationship between packaging structure, graphics, and branding, and how to create holistic design solutions. She has worked with companies in the soft goods, health and beauty, food and beverage, consumer electronics, and apparel industries, including: P&G, Aerie, Nike, Patagonia, Wrigley and Dell. Before joining Ziba, Jessica worked for a Minneapolis-based design consultancy, Baker Associates. During her time at Baker Associates she designed packaging graphics and interior signage for Fortune 100 companies in the food and beverage industry. Jessica has a Bachelor of Fine Arts degree with a concentration in Graphic Design from University of Wisconsin-Stout. Jessica loves illustrating, whitewater kayaking and traveling, and has backpacked through most of Mexico while perfecting her Spanish. Portfolio One on One is coming soon ARE YOU READY?!?!? Not long ago Kayd Mustonen & Katie Lupton were sitting next to you in class, getting ready to be released onto the world. Now transplanted back into the big city, we’re doing the design thing and coming back to share some advice and some laughs. The Pivot Series is designed as an opportunity for AIGA student groups to develop programming for their fellow students who reside and study in the upper Midwest. Bridging the gap between college life, and the design world is one of the biggest steps student level designers face at this stage in their lives. At Pivot :: Bridge we’re hoping to make that transition a little bit easier. 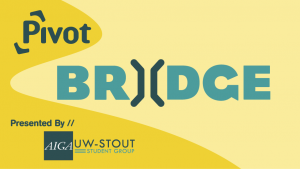 We’re inviting several University of Wisconsin-Stout alumni who have successfully entered the design world within the past few years and landed jobs at the highly influential and innovative interactive design firm space150. They’ve worked on huge projects with enormous big- name brands such as Forever 21, Starz, Best Buy, Target, and American Express. The speakers from space150 will be talking about their experience making this transition, and what it’s like out there living the dream at such a huge company just a handful of years after graduating. Following the speakers, members will have the opportunity to make designer trading cards and having a meet and greet with fellow Pivot attendees. 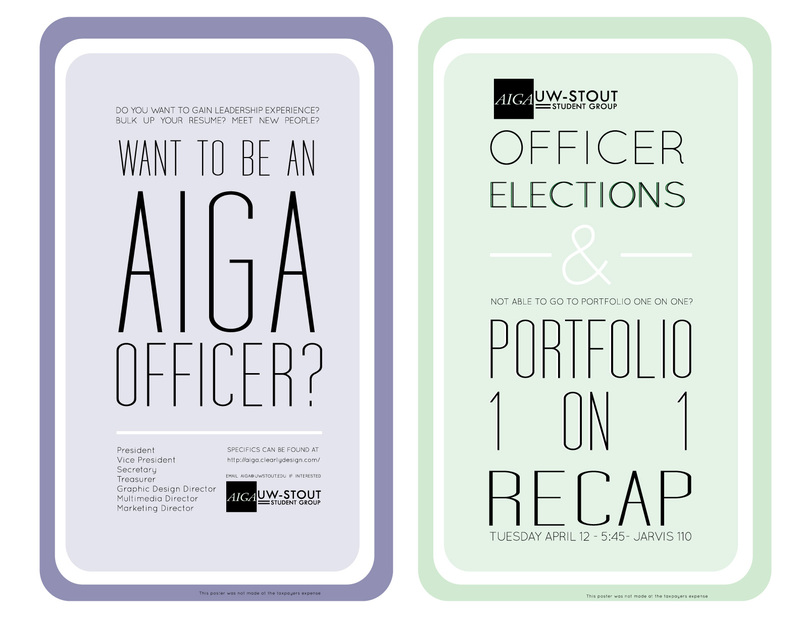 AIGA members can trade information with someone new, and by the end of the day not only will they have invaluable information about the transition from school to career, but also have a new business contact with someone who’ll be entering the design world around the same time they will be. 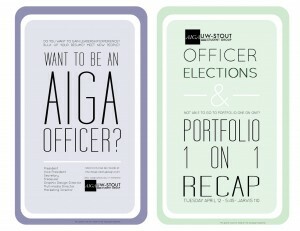 Members of the AIGA UW-Stout Student Group DO NOT need to register. 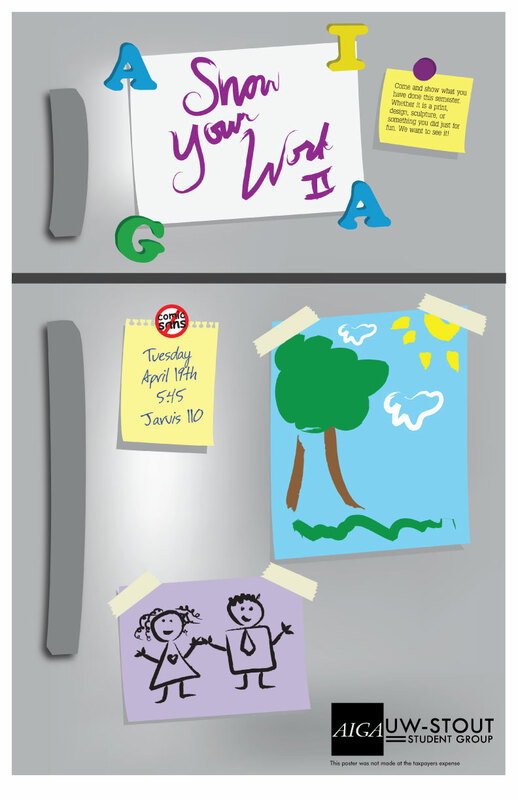 Simply bring your Student I.D. with you to the event ($10 without I.D. ).